SCUBA offers a lifetime of adventure, get started on your adventure with Jim's Dive Shop's Open Water Diver Course. At Jim's Dive Shop, your Open Water Diver Course consists of classroom, pool and open water instruction to master the skills necessary to earn your Open Water Diver Certification and make you a safe, competent and comfortable diver. 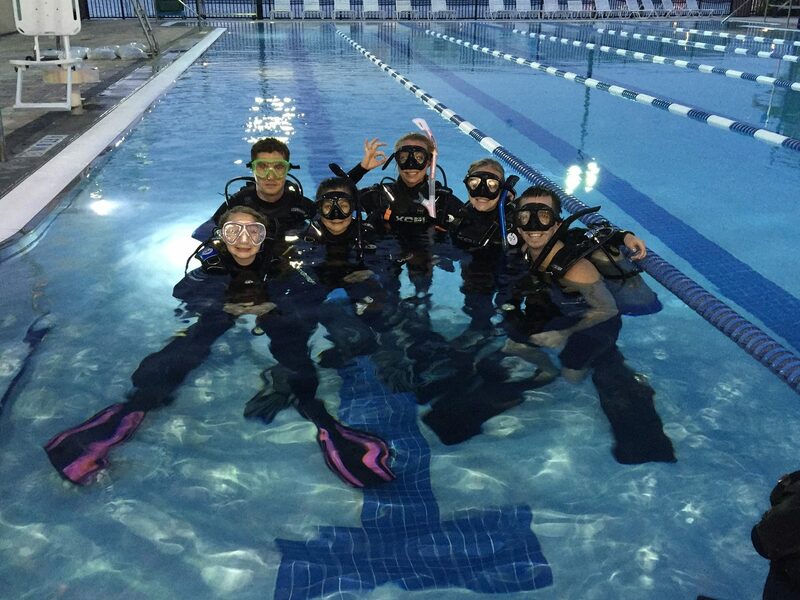 Our goal is to make you a SCUBA diver and not just teach you how to dive! At Jim's Dive Shop, experience matters - all of our instructors have been SCUBA certified for at least 10 years, have logged 1000's of dives, have first hand knowledge of local dive sites and have been teaching SCUBA for at least 8 years (Teresa has been teaching SCUBA for 25 years and has certified over 2500 students). Get Started Now - For Free! With SCUBA Schools International's online training program, you can start your adventure now, for free! If you decide to continue your education and want to become a certified diver, you will need to sign up for an SSI Open Water class, at Jim's Dive Shop. We have a variety of class times and course fees available for you to choose from that will best fit your schedule and budget. What are you waiting for? Click the link below and take the plunge! Your Open Water Diver Course fee includes: SCUBA Schools International's Open Water Diver Kit (choice of on-line, interactive course or textbook), use of our Total Diving System (regulators, buoyancy compensator, tanks and wetsuits) classroom sessions, pool sessions and your open water checkout dives. Your course also includes the Nitrox Specialty Certification. Personal gear (mask, fins, dive boots or socks, snorkel and weights) are not included in course fee. Group course fee is $349.00 per person - based on class schedules listed above. Private course fee is $650.00 per person - we will work with you to design a schedule that best fits your needs. Please give us a call to discuss private lesson fees for more than 1 person. Not included in the course fee is your personal SCUBA gear. Students must provide their own SCUBA quality personal gear: mask, fins, snorkel, weights, weigh belt and dive boots or dive socks. These items are available for purchase at Jim's Dive Shop. Since SCUBA is an "equipment intensive sport", having proper, well fitting gear is vital to your comfort level in the water. We understand the showroom is not always the best place to judge the fit and comfort of your SCUBA gear therefore, we will happily exchange any item you purchase from Jim's Dive Shop (even after you have used the item) to ensure your comfort. Please stop in to see us so we can discuss a schedule and your equipment requirements that best fits your needs and budget. For cancellations more than 72 hours in advance of the first scheduled day of class, student may reschedule to a later class for no additional fee. For cancellations less than 72 hours in advance of the first scheduled class a $100 rescheduling fee will be charged to move to a later scheduled class. In the event one needs to completely cancel their SCUBA course, monies paid towards the class less $100 will be refunded. Students are responsible for their own transportation to the class, pool and open water sessions. Jim's Dive Shop and it's contracted instructors will not provide transportation. Your SCUBA course at Jim's Dive Shop can be completed with group lessons or private, one-on-one instruction. For private, one-on-one instruction, please give us a call to discuss a schedule that best fits your time frame. For group lessons, please click the links below for the latest open water class schedules. At Jim's Dive Shop, we limit the class size to a maximum of 8 students, so that we can ensure each student will receive the attention needed to become a confident SCUBA diver. Classes fill up quickly - a $100.00 deposit will secure your place in the next available open water class (the $100 is applied to your course fee). When you buy an Open Water Diver Package, which includes your Student Kit (learning materials), your personal Snorkeling System (mask, fins, snorkel, weights, booties and mesh bag) and your Personal Life Support System (regulator, buoyancy compensator and dive computer), you will save over $390.00 (that's like getting you're lessons for free) on the package as compared to buying the items individually. We have several packages to choose from or we can build a SCUBA package that best fits your diving needs. If you're not ready to buy the complete package at the time of your SCUBA lessons, we can still give you the "package price" when you decide to purchase your (Life Support System), if you have purchased your Snorkeling System from Jim's Dive Shop. Click the link below for a complete list of the items included in the packages. Why SCUBA Schools International (SSI)? With the many SCUBA training agencies that are available, Jim's Dive Shop has choosen SCUBA Schools International for our SCUBA certifications. Established in 1970, Scuba Schools International provides high quality, innovative training methods and materials to select SCUBA-training facilities worldwide. To date, SSI has 31 Regional Offices, is represented in 110 countries with 2,401 International locations and has materials printed in 24 languages. Your SSI SCUBA certification is recognized through out the world's diving destinations. SSI Instructors are required to be affiliated with an SSI Dive Center. This ensures that your instructor will be monitored on an ongoing basis in regards to professional conduct and the maintenance of up to date quality training techniques.